The fortunes and failures of the Women’s United Soccer Association can be extrapolated from a single week in August 2001. The city was Boston, and the occasion was the end of the league’s first season. There were parties and press conferences, trophies and tributes. But all of it cost money. The WUSA had plenty of that to start, but they were burning through it like a house without heat. Just behind the most glorious week in the history of women’s club soccer in America, the trail of failure loomed, and the bubble was about to burst. The WUSA was, first and foremost, a TV league. Unlike the Twitter-centric Women’s Professional Soccer and the streaming-centric National Women’s Soccer League, the first go at a pro league for women was founded by rich television executives hoping to create valuable new properties for their empires. The opening match was aired on TNT by Turner Sports and was played in front of more than 34,000 fans. It was the 1999 World Cup that made John Hendricks believe a professional league could work. Hendricks, founder of the Discovery Channel, secured investment from COX and Comcast and brought on billionaire Amos Hostetter Jr. But sometimes when there’s money, it becomes too easy to spend it. And then it becomes too easy to waste it. WUSA players were treated well. The league built itself around the 20 members of the ’99 world champions who they called Founding Players and were paid more than $80,000 per season. All of them were flown to Washington, D.C., for the inaugural game, and then to Boston for Founders Cup week. (The trophy was an exquisitely-designed ode to the founding players and investors, whose names adorned two of the three sided base; the third side was inscribed with the names of the league champions each season.) The Global XI, a haughty but rather appropriate moniker from a time before the rise of European power clubs, were also flown in for the week. So were all of the league’s coaches, public relations directors, and some other team staffers. You can see where this is headed. But the WUSA was everywhere. Games were on television locally as well as nationally. When the CyberRays struggled early, it allowed Chastain to guarantee they would be in the championship match during an appearance on The Late Show with David Letterman. When the Twin Towers came down, the New York Power players and staffers were local and available to pitch in on the volunteer efforts. A few weeks later, the Power and Freedom were able to congregate and turn a fundraising movement called The Unity Games into doubleheaders with their MLS counterparts D.C. United and the MetroStars (now the Red Bulls). The WUSA also had beautiful soccer. Lauren Gregg was hired to recruit international players and she convinced not only five members of the Chinese national team to come to the league, but the federation to sign off on the arrangement. Hege Riise and Dagny Mellgren came from the Norway team that had beaten the United States in the 2000 Olympic Gold Medal match. Maren Meinert came to play in the country that broke her heart in the 1999 World Cup and she wound up turning the tables on the U.S. in the weeks after WUSA folded in 2003. She was later joined by Birgit Prinz, who brought an uncommon physicality to the league. 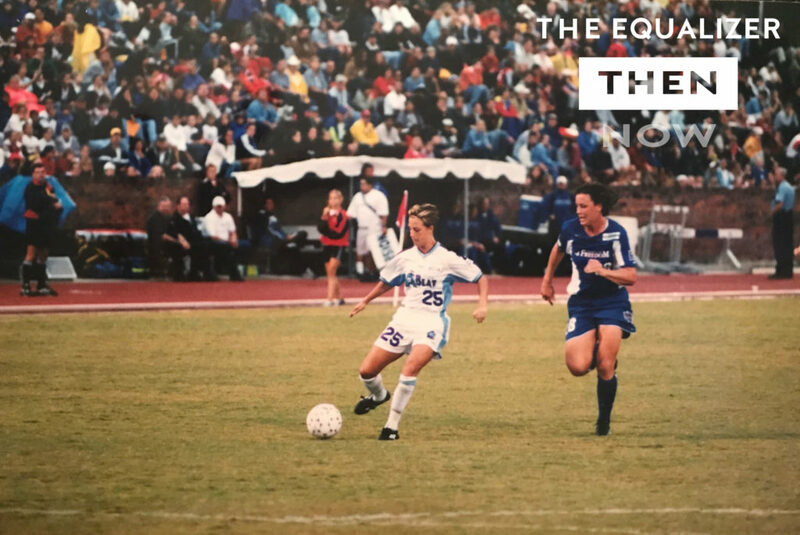 Marinette Pichon arrived as an unknown and tore it up for the 2002 Philadelphia Charge while sewing some of the earliest seeds in the rise of French women’s soccer. Americans also made their impact — and not just the established stars. The Freedom drafted Abby Wambach in 2002 and watched her develop from a player who was considered lazy in college into a world-class goal-scorer. A year later, the Charge drafted Hope Solo. It would be a few years until Solo became a star, but she and Wambach eventually formed the heart and soul of the U.S. national team all the way through the next World Cup triumph in 2015. Within the league, Wambach and Hamm teamed up to form a lethal forward tandem and wound up winning Founders Cup III. Wambach scored the golden goal to win that match, which turned out to be the last official WUSA contest. The league made efforts to stay afloat by staging exhibition matches in the summer of 2004, but it was not to be. “I was intoxicated by what I witnessed in 1999 with the corporate sponsorship. I mistakenly assumed it would overflow onto the league,” Hendricks said when WUSA announced it was folding less than a week before the kickoff of another World Cup in the United States. Was that mistake assuming that corporate money would flow into the league? Or was the mistake spending that money before it was found? The WUSA poached Quaker Oats executive Barbara Allen to be its CEO. That looked like a boon, but Allen’s business acumen was not necessarily suited to running a sports league. And she did not come cheap. During that Founders Cup I week, the trophy was on display around the city of Boston. There was a lavish party the night before the match, and another only slightly toned-down event the night of what was an enthralling final. But by that point investors had already spent what they thought it would cost to get through 3-5 years of the league’s existence. They cut back for 2002, and cut back more drastically for 2003 after nearly cancelling the season. The situation was so dire when WUSA pulled the plug that they were unable to remain liquid through the World Cup to see if sponsors would catch the fever. 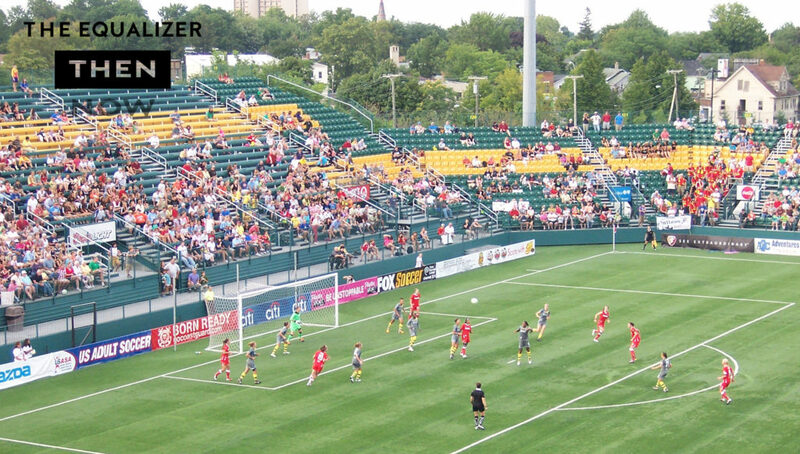 Since WUSA went away, WPS came and went (three seasons from 2009-2011) and now the NWSL struggles for relevance. WUSA was hardly mainstream, but it offered a certain relevance that the next two leagues have yet to find. One has to wonder where professional women’s soccer would be today if it had survived its early years in good health and was still being funded by television magnates. Instead, we are left with the memories of what women’s pro soccer once was, and a vision for what it could become again.